The struggling Knicks stunned the Celtics last night at TD Garden, ending a six game losing streak, with a crushing 117-109 victory over their rivals. Okay, so it wasn’t really crushing judging by the score, and it wasn’t far from being the seventh straight loss judging by the multiple ways the Knicks have found to collapse after being in control. Even last night, New York , who led by as many as 26 points before halftime, almost collapsed in the final minutes when Boston cut the lead to three (!) points with 34 seconds left on the clock. But this time things have finally shifted Knicks’ way. 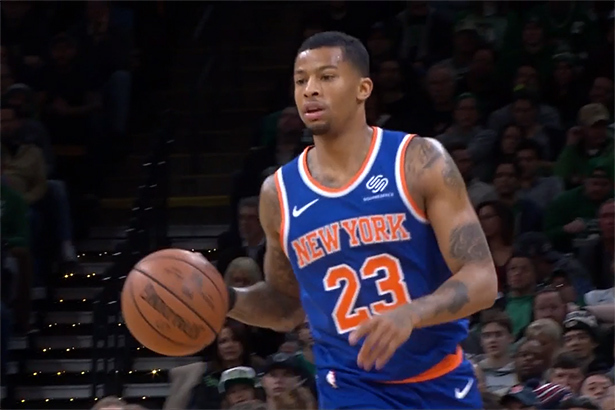 Trey Burke, who scored a game high 29 points off the bench, nailed the dagger with a 25 foot three pointer on the last 13 seconds which gave the Knicks a 115-109 lead, enough to seal the game. Just several seconds earlier, Burke made another two-point jumper after Gordon Hayward’s long three that put the Celtics down by four. Burke also dished a season-high 11 assists and outplayed Kyrie Irving, who finished with 22 points and 13 assists. Tim Hardaway Jr. added 21 points and Massachusetts native, Noah Vonleh dropped 16 points, 10 rebounds and three blocks and rookie Kevin Knox followed with 11 points and 9 rebounds off the bench, shooting 3-5 from the field. Celtics heard boos from the crowd since the second quarter onward as their fans became more and more frustrated with their favorites’ inconsistency. Boos intensified in the final quarter and after Mitchell Robinson’s basket that put the Knicks up by 16 with five minutes left to play, many of them headed to the exits. Marcus Morris scored 21 off the bench for the Celtics, Gordon Hayward and Al Horford added 19 points each while Jayson Tatum contributed with 15 buckets. Boston becomes a .500 team after going 0-3 in their last three games and New York improves 5-14 after losing a close game a night before, at home, to the Portland Trail Blazers.